Dali Guo passed away on 19 November 2017 at the young age of 46 after an extended fight with lung cancer. He leaves behind his loving wife, Ping Wang and 14-year-old daughter, Hengjia. Dali Guo. Photograph credit: Bo Liu. All who knew Dali recognized a person who had a keen intellect, driving curiosity of the natural world, and the organizational skills to mobilize research teams to answer critical questions in plant and ecosystem ecology. Dali was also exceptionally kind and generous, supporting a seemingly boundless circle of colleagues who, upon meeting Dali, instantly became friends. Dali was one of the leading thinkers and researchers in root ecology and was a major promoter of developing a global understanding of root traits. His work also extended to link roots and mycorrhizal fungi more broadly to leaf traits and whole plants. For the past decade, he worked to establish a network of research investigators exploring plant and root ecology across China, taking particular advantage of the numerous research stations of the Chinese Academy of Sciences (CAS) that capture the diverse landscapes and flora of China. Dali also was a key force at fostering international collaborations with leading scientists in the field. During this period, he helped establish the importance of root branching order on root function, synthesize evolutionary patterns of root traits and addressed how root traits shift with changes in the environment. Dali published over 59 publications during his short, but highly productive career, with a significant portion of his work published in New Phytologist (11 publications). In addition to the numerous faculty of CAS that he helped train in root ecology, Dali also mentored 21 graduate students and seven postdoctoral fellows. Dali was a member of the Advisory Board of New Phytologist from 2010. He also served on the advisory boards of Global Change Biology (2011–2014), Journal of Plant Ecology (2009–), and as an Associate Editor of Journal of Ecology (2011–) and Elementa: Science of the Anthropocene (2013–). Dali was born in Gansu province, China, on 6 March 1971. He started his academic career at Nanjing Agricultural University, China, where he acquired his Bachelor of Science degree in Soil and Agricultural Chemistry in 1992. He went on to pursue training in forest soil science at the Institute of Applied Ecology, Chinese Academy of Sciences. In 1997, Dali decided to pursue a PhD degree in the US, where he received a PhD in Forest Ecology at Virginia Polytechnic Institute and State University. In 2002, he worked as a postdoctoral fellow at the Joseph W. Jones Ecological Research Center under the guidance of Dr. Robert Mitchell. In 2004, Dali joined the faculty at Peking University as an assistant professor in the Department of Ecology, College of Urban and Environmental Sciences. He was promoted to associate professor in 2005. In 2011, Dali moved to the Institute of Geographical Sciences and Natural Resources Research, Chinese Academy of Sciences as a full professor, under the umbrella of the Hundred-Talent Program of China. In 2013, he was recognized as a Distinguished Young Scholar Fellow, an eminent achievement for scholar under age 42, awarded by the Natural Science Foundation of China. 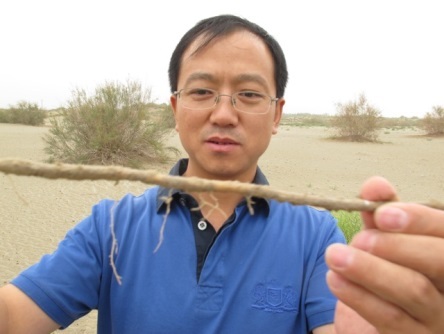 The passing of Dali Guo at such an early age is a great loss to the plant and ecological sciences. We are comforted, however, by his legacy that includes not only his numerous quality publications, but also by his students and collaborators, who were touched by his kind spirit and passion for research.